Planning those first steps before a wedding can feel like some of the happiest moments in your life. They are also the most crucial for planning the perfect event. You can download the First Year Timeline for free to plan the major events of your wedding to ensure that everything is completed on your time. The free template has everything you need to enter major items like “Buying the Cake” or “Booking the Venue” and keep that information in a way that’s wonderful and easy to follow. You can view the entire planning sheet of items you have so far in both a calendar format and a simple timeline. Make wedding planning easy on yourself by downloading this free template today! To download your new First Year Timeline, just click the link at the bottom of this page. Begin your journey in the “Events” tab at the very bottom of the page. This simple table will give you a place to plan out all the major items of your wedding in a fun and easy way. In this table, you can enter the date, day, and month of the items. You will then give a brief description of the wedding event, along with a height (where you want the item to appear on the timeline page). If you go over to the “Timeline” tab now, you will see all your items have been converted to this simple and fun format. You can see how planning the different events will happen for the foreseeable future. When you want to create a calendar view of your wedding planning items, you can do so by clicking on the “Calendar” tab below. This is more or less the same, but it makes keeping track of the items much easier. You can just look up the date and see exactly what needs to be accomplished. 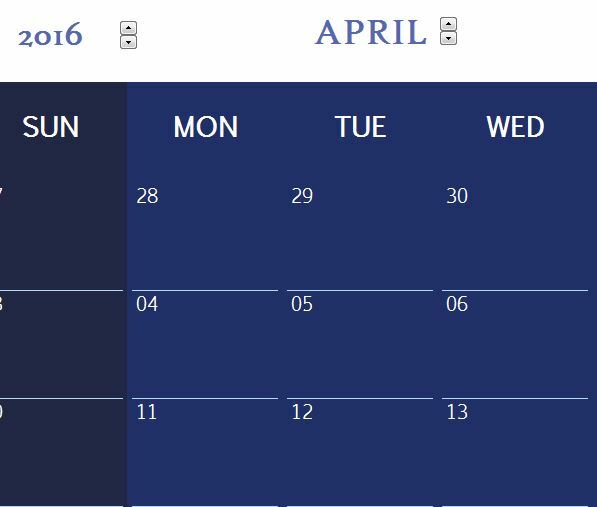 There is also a printable version of your calendar in the last tab. All the items that you entered in the “Calendar” tab will be transferred to the “Print Version” as well.